A BUBBLING CAULDRON: Want Some Magic In Your Life? HAVE I GOT A DEAL FOR YOU?! In need of a little "magic" in your life? Well, have I got a deal for you! 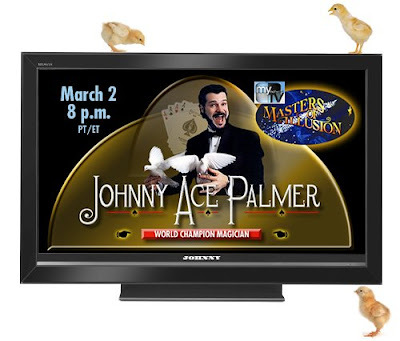 My old pal, Johnny "Ace" Palmer, World Champion Magician, recently sent me this information in an email. We've known Johnny for years (he's a Huntington Beach resident, by the way) and have seen him perform his act many times - including at couple of my birthday parties - and think he's a terrific entertainer, so we wanted to share this opportunity to watch him on television with you. MONDAY, CHANNEL 13, 8 P.M. 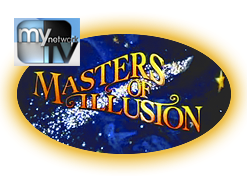 He will be appearing on Masters of Illusion on MyNetworkTV (KCOP Channel 13), Monday, March 2nd at 8:00 p.m. I know you'll enjoy his performance, along with those of many other magicians, so mark your calendars and set your TIVO. Hi, everybody! It's us, Johnny Ace Palmer's baby chicks, Fluffy, Puffy, and Duffy, here to announce we're going to be on TV! This time, your easy chair is in the front row! Johnny will be performing some of his classic illusions! What? You're having a brain transplant that night and you'll miss it? Relax—the above episode (Number 5) will be rebroadcast Monday, April 6, 2009! Monday, March 23 through Sunday, March 29, 2009! where he'll be celebrating 15 years as house magician this May! Visit Johnny's site, call him directly at 714.373.TRIX  or email him at johnny@johnnyacepalmer.com. Visit the Magic Castle's site, ask for Mark Felicetti at 323.851.3313, Ext. 350, or email him at mfelicetti@magiccastle.com. Visit Earth, Wind & Flour's site, ask for Dennis Klempner at 310.829.7829, or email him at earthwindflour@aol.com.